Manxies and puffins return, phew!! To the great relief of the wardens and volunteers on Skomer the seabirds have started to return. The last few nights have seen large numbers of puffins gathering in North Haven. Watching them come back for the first time is a special moment. The seabirds are clearly nervous of coming on land - a place which is riddled with dangers, gulls, peregrine falcons and possibly a rabbit trying to occupy a burrow once occupied by a puffin. In a fight between a puffin and a rabbit, my money would always be placed on the puffin winning. Something I have not seen before is Jackdaws squabbling with puffins. I can only assume that the jackdaws - which we have seen with nesting material over the past week - have also decided to try and occupy a burrow......IF I were to place money on a jackdaw vs a puffin I would be taking more of a gamble. Beyond the trials of other species of birds there can also be squabbles between individual puffins. There is also a lot of parading around, flapping of wings, shaking of heads and billing. Billing is where two puffins "kiss" with their bills. This often attracts the onlookers and sets other pairs off. We all know what happens next. Some of the puffins that have been seen rafting are young ones from last year, they can be seen by their dusty faces and slightly smaller bills. These birds will not breed this year - may visit the colony for several year before starting to breed at the age of four or five. The Manx Shearwaters are also returning slowly and steadily. Interestingly there has not been a huge rush for the manxies back to their burrow. Normally the first birds are seen on the surface around 14th/15th. This was true to form this year but there has not been any big returns. This has started to change over the last few days. There are several explanations for this. Firstly their was a full moon 19th March (thus dangerous times for Shearwaters to come ashore) or birds have had a tough time crossing the Atlantic on their return trip or there has been plentiful food on the return legs and as a consequence birds have been feeding up before returning to the burrow. All will become clear throughout the season when data from the study birds long term tracking devices are downloaded and analysed. We shall keep you posted. The accommodation is looking really smart thanks to the hard work of the volunteers and many litres of paint (and new duvets/pillows!). So we are looking forward to welcoming the first Shearwater fans any day now. The island technically opens on 1st April, but with the current weather this might be postponed a few days! 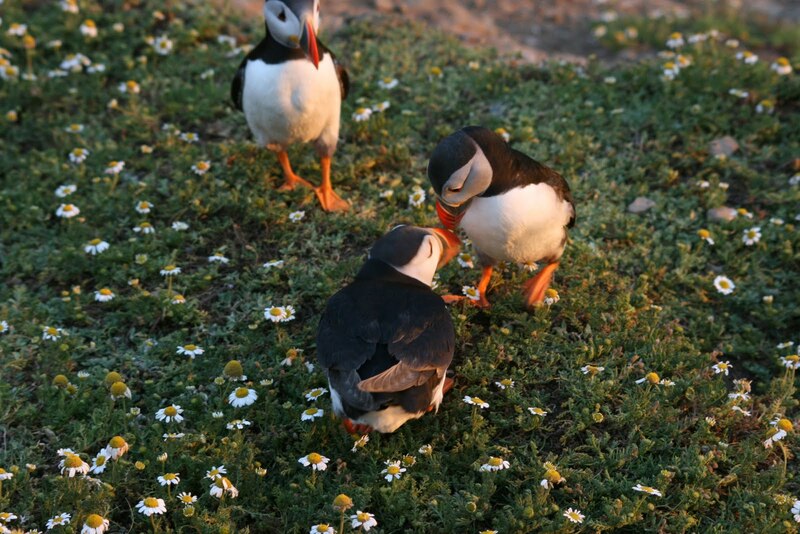 Wardens back on Skomer – but what do they do when there are no Manxies, Puffins, people or volunteers? Well actually quite a lot! This winter must have seen some harsh winters. I was inspecting the water tanks at the start of the season to find that the header tank (a 20ft by 10ft and 4ft deep tank) was completely empty. Odd I thought. Only to find a crack in the pipes leading to one of the pumps. After reusing some old parts from the plumbing equipment collected over the years we managed to fix it. This leak was caused by freezing water in the connectors/ pipes. There was also a leak down in North Haven – this was fixed with good old Duct Tape (temporary repair)! The tractor is also in bits and awaiting a mechanic to fit a part to the axle – this is to be expected if you dip a tractor in the sea every week. The boat has received some damage from a rockfall over winter. The landing stage/steps all need some repairs. 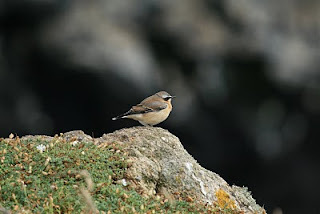 Essential to keep your eyes peeled at this time of year, looking out for those first Wheatears (4th March this year). They have only been earlier than this date on 5 different occasions since, c.1960. On the same day first records were reported on Bardsey and Portland – so we must have been in the firing line for the migrants to return (from North Africa/Morrocco). 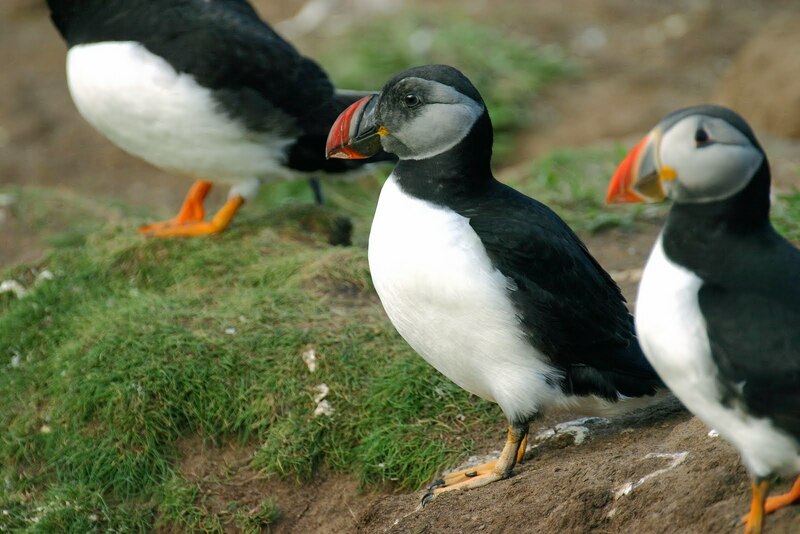 It is also the time to look out for the first Puffin at sea but the real first is to get the first Puffin on land. Then there is the first Manx Shearwater (at sea and on land). Both the Manxie and Puffin usually start to arrive around 14th March, so any day now! The Auks have been on off the cliffs since our return with the Fulmars getting fairly settled in. Ravens at Amy’s Reach are already on eggs. There was one seal pup on Driftwood Bay on our return. Yes we are painting the volunteers kitchen. This year we have quite a few left over tins of paint of various colours. I was keen to use them up so we are going to be loosing some of the magnolia. This means the volunteers have one green wall (it is ok honest) and the overnight lounge has a nice blue wall which makes it feel a little more homely and less “magnoliary”. This is an annual job to keep the place fresh. This is a nice time of year for the staff to get to know each other. Myself and the assistant warden (Sarah Harris) have only ever met once before at the interview. Now we are living and working on an island. All getting on well (it seems!?!). It is also a good time to train people up on the buildings/running day trips. In 2011 we have decided to go through all the bedding and get rid of those unsuitable duvets (especially after a winter sat inside). New pillows/duvets have been ordered for the volunteer accommodation and some pillows/duvet replaced in the overnight accommodation. Gas needs to be delivered, cleaning products ordered, loo rolls stocked up. You have to get out at this time of year. Not many times when you can do a complete loop and not bump into one single person! Speaking of which......I am off! We shall let you know when those manxies/puffins are back, I can't wait to see them!